Discussion in 'Outdoor Cooking and BBQs' started by rascal, Feb 11, 2019.
i don't know if any of you guys have access to cheap gas powered bbqs. Ours is an 18 inch cast iron round plate with 3 legs and cost us $80. The gas bottle was about $25. It takes up no room in the car, we got ours for Xmas bbqs at the beach on our holidays, but with beautiful weather here yesterday we took it to a reserve with grandkids. Kids love sausages in bread. Simple as and cheap as. Easy clean up. We have a couple of portable gas BBQs (they weren't that cheap tho!). 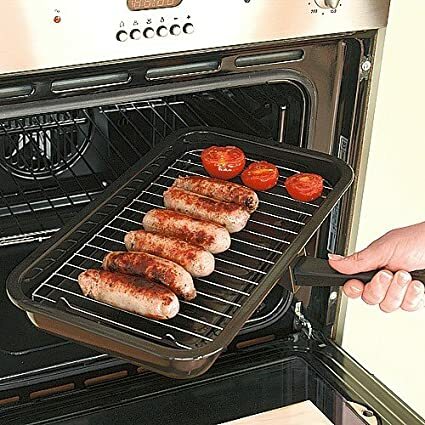 It packs up into a really small carry bag but because it doesn't have long legs you need to either use it on a table top or sit down whilst you're cooking. Its really versatile though so the short legs are a compromise worth making. We don't carry a separate gas bottle for this one, we just plug it into the motorhome's gas system. Too bad that those are for use outside only. Otherwise I'd have had one!! Those are grills. BBQ is low and slow using wood smoke. Don't own any gas grills. Gas is only used for my cookers for crawfish boils and steaming crabs. Yes I am a BBQ snob! Those are grills. BBQ is low and slow using wood smoke. The picture above is most definitely a BBQ (UK parlance) - check out https://www.bbqworld.co.uk/ .....I guess they'd have to call themselves grillworld in America? In US that is a broiler I believe? These are used indoors, but they are true smokers that use wood chips to give food cooked in them that true authentic Smokey flavor & taste that people love in bbq'd meals!! Dive Bar Casanova likes this. In order to smoke meat or veggies, you need wood or wood chips to do it. Those units pictured at the top of this page don't cut it. There is no wood used, meaning that there is no smokey flavor or taste. As we all know, if you smoke meat or veggies, you need wood or wood chips to do it with.